The B-Line Frequently Asked Questions, Plus a Handy B-Line Map! It’s been a whirlwind since we launched The B-Line, our new bourbon tour in Northern Kentucky. We’ve shown many journalists, from both the USA and other countries, around The B-Line stops, set up our bright red signature canopy at local events to help spread the word of this new bourbon experience, and even taken a trip on The Kentucky Bourbon Trail®, so we could add a taste of it to The B-Line. Can you spot The B-Line&apos;s booth? As you can see from the smiling photos of people who have already completed their Line Guide and received free bourbon swag, the word is out! Folks are "finding their sipping point" on The B-Line-- we’re off to a fun start! 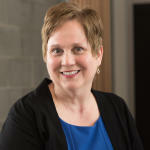 Rhonda K. - The first person to complete The B-Line! Sometimes though, when you’re close to something, you can get too familiar with its details and forget that not everyone knows your story. This was driven home last week when we got a call from someone who’d heard about The B-Line and was very interested, but had a lot of questions. So, in case you’re just hearing about it too, here are some answers to Frequently Asked Questions about The B-Line. What exactly is The B-Line? 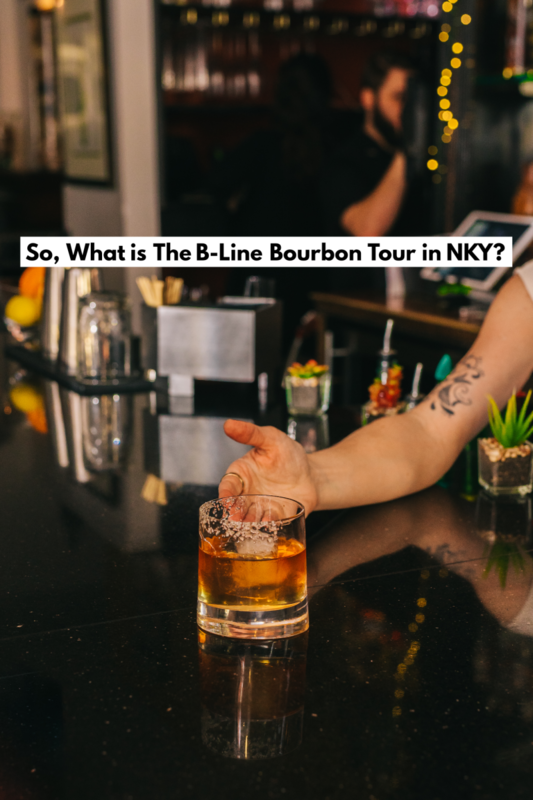 The B-Line is a bourbon tour of Northern Kentucky, just across the Ohio river from Cincinnati. It’s comprised of 12 bourbon loving spots: 3 bourbon distilleries, 4 bourbon-centric restaurants, and 5 bourbon bars. You pick up a copy of The B-Line Line Guide and get it stamped at 2 of the distilleries, 2 of the restaurants, and 2 of the bourbon bars and then you redeem it for free bourbon swag here. 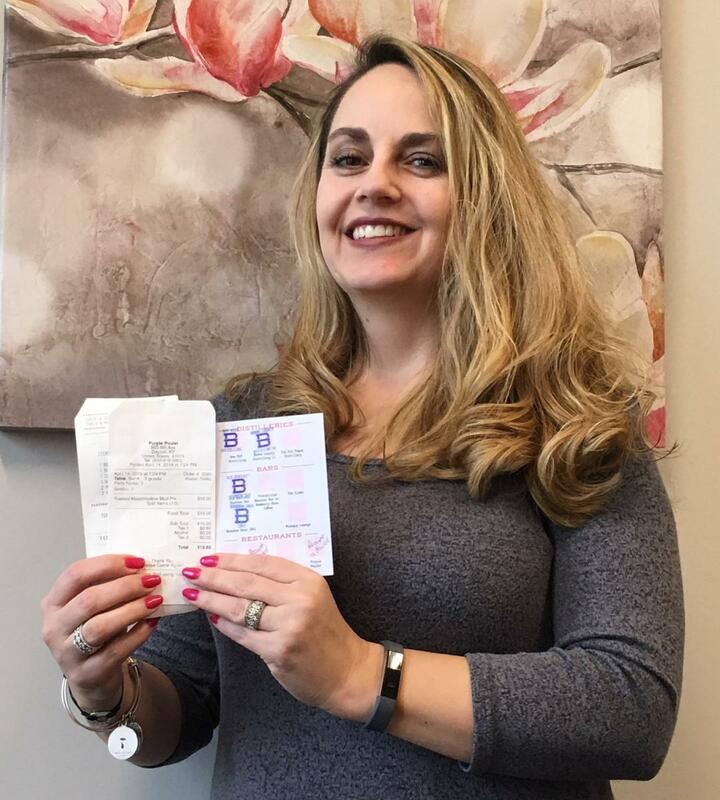 Do you have to pay for your Line Guide? No, The B-Line Line Guide is free, as is the tour itself—you don’t have to pay a fee to go on The B-Line. You will need to buy something at the bars and restaurants, but it doesn’t have to be bourbon, or even alcoholic. 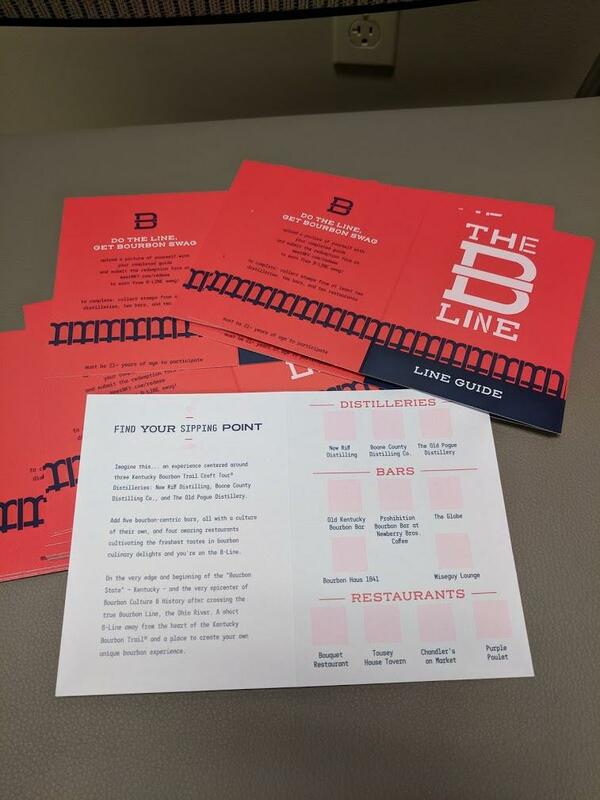 You can get your copy of the Line Guide at any of the stops, or at the Cork &apos;N Bottle at the Cincinnati/Northern Kentucky International Airport (CVG) and start getting it stamped to earn your free bourbon swag. Do you have to stay in one of The B-Line’s partner hotels? 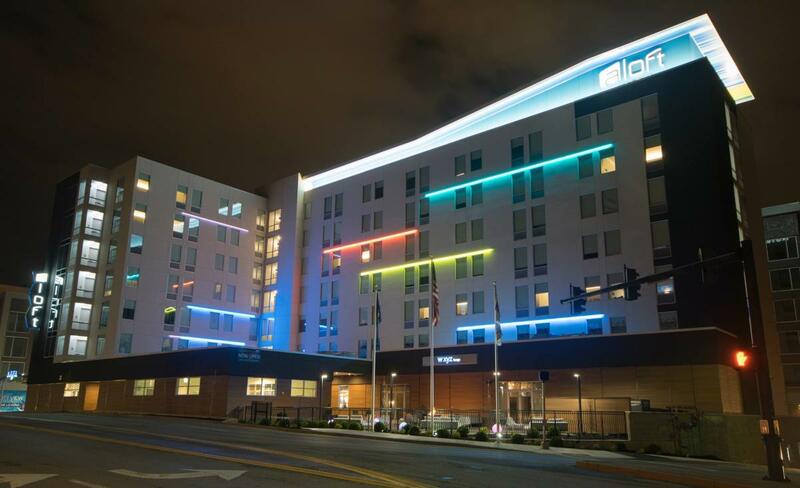 You can stay anywhere you like, of course although we do highly recommend our award-winning partner hotels, Hotel Covington and Aloft, for a stay in our area for any reason! And, of course, we think they’re the best choice if you’re here to do The B-Line. 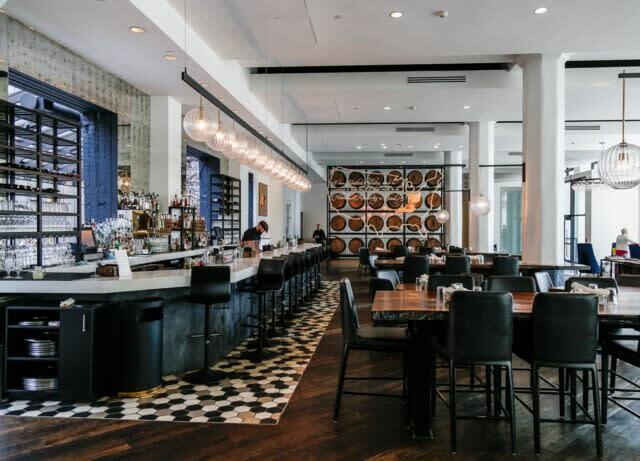 Both the Aloft and Hotel Covington have impressive bourbon collections and offer spectacular craft cocktails. The B-Line is a completely self-chosen tour. You can visit any of the stops on any day and at any time you choose, providing they’re open at that time, of course! Word to the wise, The B-Line restaurants are very popular, so it would be a good idea to make a reservation, especially if you plan to go on a weekend. How close are The B-Line Stops? And do you provide transportation to them? As you can see from The B-Line Map below, many of the stops are within a couple of minutes walking distance of each other. 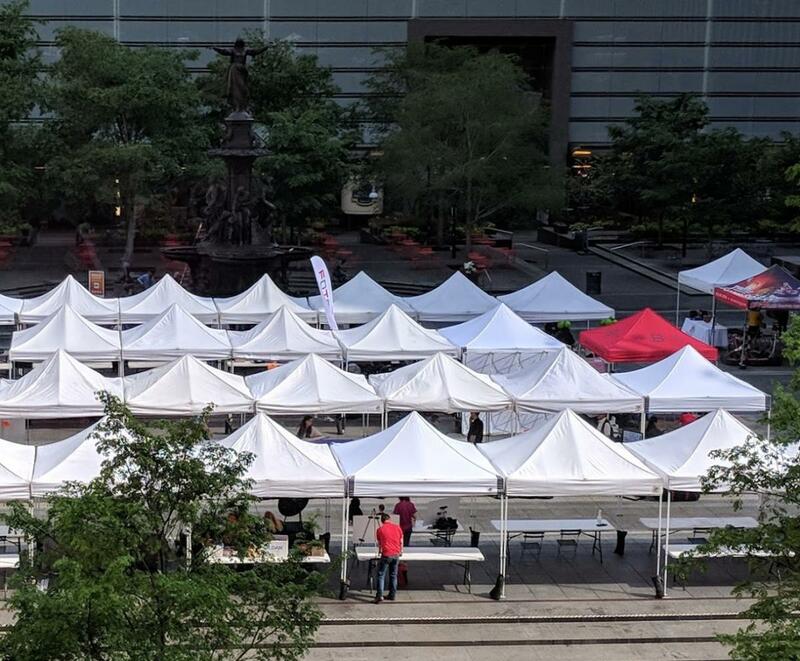 For example, Old Kentucky Bourbon Bar, Wiseguy Lounge, Bourbon Haus 1841, and Bouquet Restaurant are all in Mainstrasse Village in Covington, KY, just a few doors away from one another. And you could easily walk over to The Globe in Covington’s downtown business district from them too. A few of our stops are a bit farther away, like Tousey House. And of course, two of them, Old Pogue Distillery and Chandler’s on Market are in Maysville, KY.—a charming riverside town that’s well worth the 45 minute drive. We do not provide transportation, but we do offer a discount for Lyft and Uber to help you stay safe. We hope this gives you a good idea of how it all works. And we hope to see you on The B-Line one day soon! Cheers, y’all!